Bought this for my 4-year old in a size 3 and it fits him perfectly, and the quality is surprisingly fantastic. He is going to look so debonair as the ring barer in a wedding next month! 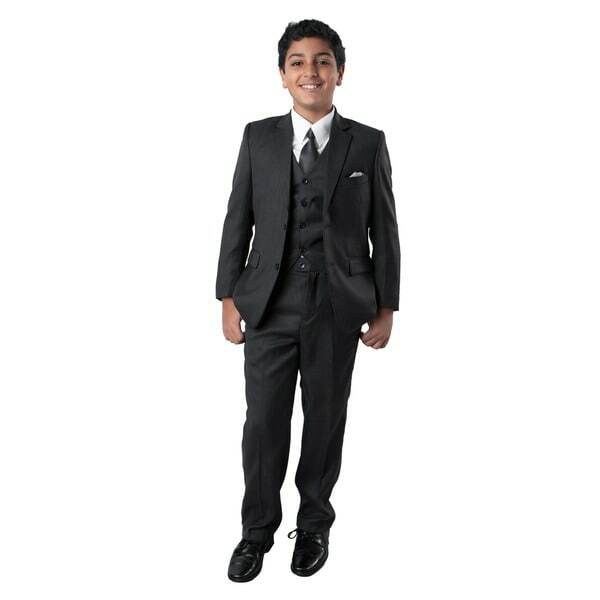 Make sure that your little man looks good on his big day out with this boy's five-piece suit from Tazio. The single-breasted design and classic colors give him a dapper, stylish look. Poorly Constructed. Poor Quality Suit. I ordered a Boys size 7 suit, what arrived was a Men size 38 suit. I called and it took a week for Overstock to replace the suit. Perhaps I should have cancelled the entire transaction then. But hindsight is 20/20. The suit arrived with multiple stray threads that I carefully trimmed down. The buttonholes were not opened, so I had to use my seam ripper to open it so that some of the buttons can be closed. The breast pocket of the jacket was sewn with visible thread rather than smoke color to match the suit. The shirt is disproportionately smaller than expected for a size 7 suit. It would have been better suited for a size 6 suit. The tie has a cheap elastic strap. The elastic was so weak and floppy that the tie would not stay in position, it needed to be safety pinned in place. With the additional week long wait and no other suit, we could not return and get a replacement in time. My son wore this suit for 4 hours. It was then promptly hung up, the shirt laundered. I went to dress my son for picture day and to my horror, the jacket button was dangling. I figured, no problem, I will just put in a few stitches and secure the button. When I inspected the pants, along the crotch the seam was undone, up the back of the pant, the same. The vest buttons continued with trailing threads that left the buttons very loose. The pant button was loose. This is terribly upsetting because prior to this, it was worn carefully for 4 hours or less in a controlled environment. The suit fit with room to spare so there was no undue stress placed on this suit yet it is falling apart. I had to basically repair and reinforce the crotch and rise. I had to reattach and reinforce 6 buttons. If I did not know how to sew or have a sewing machine, it would have been disastrous. I am disappointed with Tazio. This suit quality is disgraceful. While it looks very nice in the photographs, in reality it is a mess. I will not recommend that anyone buy this suit and if asked to price it based on workmanship, I would say it is worth and should be sold for not a penny more than $**.**. That might even be too generous; however since fabric needed to be paid for that is what it is worth in my opinion. Rating this suit with one star is erroneous. I wish I could give a zero or more accurately a negative rating. Boy's Suit, Better than expected! The quality of this suit was far beyond my expectations, from all the pockets inside to the quality stitching. It will be passed down through the family! This suit is exactly what we needed! The back of the pants have an elastic in them so they were a perfect fit, and the jacket isn't as bulky as it looks in the picture. I'm so glad it came with a white shirt, vest & tie. Really can't get a better deal with the quality & price! I ordered this for my nephew as a Christmas gift. He was so excited when he unwrapped his box. It fit perfect; true to size. He’s thin, so the buttons allowing “take-up” in the waist were perfect. Beautiful and very high quality suit, I would definitely recommend for any type of ocassion. Even though my son is on the slim side the suit looks beautiful and best of all it adjusted to his waist size. The pieces is a great buy. It was perfect for my son and he loves it. The fact that it is all complete without worrying to buy shirt and tie separate makes it a great buy and will recommend. Great quality, so cute on my boy!! 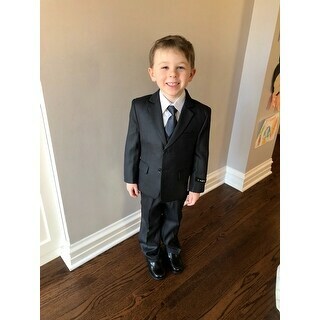 Perfect suit for my son to wear to his older brother's wedding! Hate spending a lot on a suit my son will out grow in one year. The suit looks expensive. Important because inexpensive should not look cheap. My son looks like a million dollars. Great suit for a growing boy. I purcahsed this for my son he has worn it on many occasions. It is looks great with white, blue , or black dress shirts. He has even used it as a tuxedo with a cummerbund and bow tie. Greta value for the price. Great quality and fast shipping. Grandsons looked so handsome in my son’s wedding. Great suit for the price. Holds up well. Quality is great. I have bought a few of these suits over the years and they have always been consistent. Suit has held up well but ran VERY large for it's size. "I'm interested in buying this suit, but need measurements for the size 7 and size 8 suits (coat measurements & pant inseam measurements). Thank you!" Hello Anne F., thank you for your inquiry. Unfortunately, the information you have requested is currently unavailable. You will receive an email notification once an answer is posted. Have a great day. It looks great and neat so I hope it will just be like the way it looks. "Hi, several questions: 1 - what are the measurements (chest, waist, inseam) on the size 7? 2 - are the pants flat-front or pleated? 3 - are the pants elastic waist? adjustable waist? Thanks, MK"
Hello noydb. There is about an inch to a inch and a half to let out. I would suggest you buy according to your actual pant size. Please let us know if you have any further questions. "I am trying to match a men's grey Tazio suit for my wedding. The ad on this picture says that the suit is grey but the picture looks very dark, almost like a black suit. Is this truly a lighter grey suit?" Hello rocky, this suit is a darker grey. Thank you for shopping with us. "What are the inseam measurements for size 16 and 18?" Hello SoSoMom, thank you for your inquiry. Unfortunately, the information you have requested is currently unavailable. We will continue to try and answer this for you. You will receive an email notification once an answer is posted. Have a great day. "I would buy this product if I could get measurements for a size 14 or 18. It seems silly that you can not provide that information for a suit." Hello Gina, a size 14 has a 36.5 inch chest and 28 inch waist. A size 18 has a 39.5 inch chest and a 30 waist. Thank you for shopping with us! "Does the vest have a back and if so what color?" Thank you for contacting us, Gina. Yes it does and its Grey. Please let us know if you have any further questions.